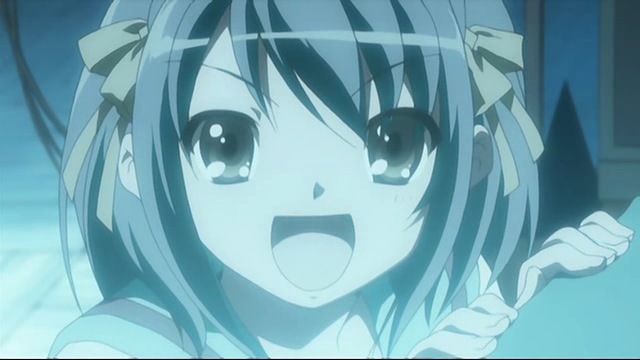 Regardless of what I have said about The Melancholy of Suzumiya Haruhi in the past, I will say this now: the conclusion goes up in the Alexian Anime Conclusion Hall of Fame for being made of fantacularity. 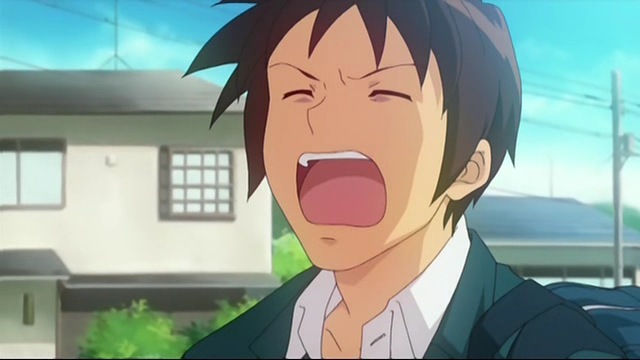 Episode 13 can be summarised in one word: “EXPOSITION!” Itsuki calls out Kyon and shows him closed space while shouting exposition at him. 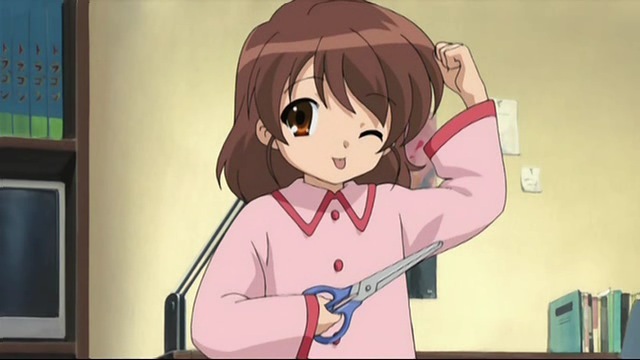 else lives the same way as she does: essentially, that she’s an anime fan. 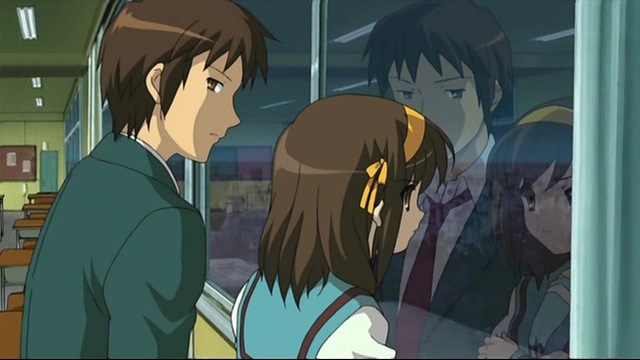 This melancholy with her scene leads to her showing Kyon closed space herself. 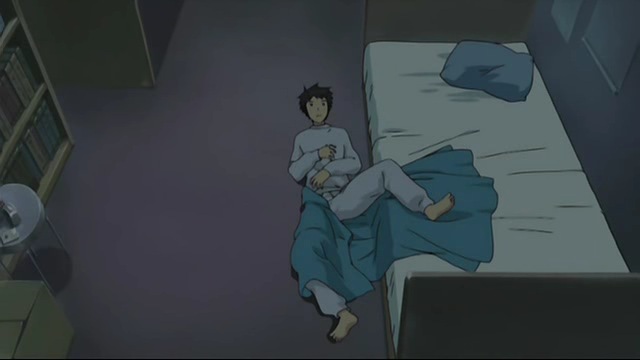 It’s good stuff that makes me wish that this had been a six episode series, or OVA. 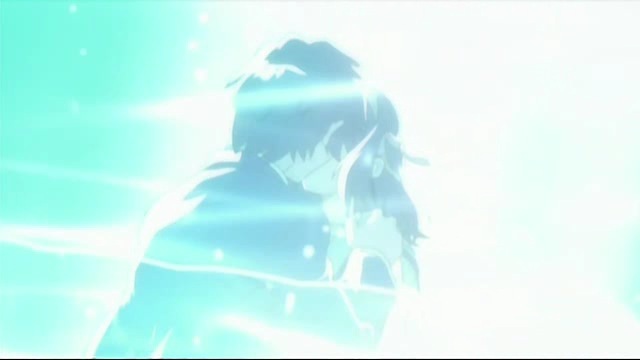 The ending is so conclusive that it’s hard to imagine all of this stuff that’s been happening in the series set after the main story, and it’s disappointing that we had to see all of those things that sent all of these characters back to square one. That’s right: these last two episodes gave us some dang good character development but all of the episodes that were set after them gave us regressed characters who were more interested in antics than in saving the world and what have you. 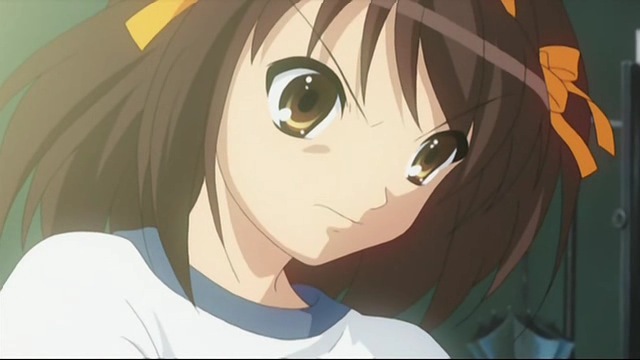 Kyon said “I may complain all the time, but I like this life”, yet in those post-finale episodes he still complained about everything and didn’t like anything that Haruhi had to say for herself. Stupid bastid; I suppose that when the author figured he was onto something, he had to bring the characters back to that which they were known and loved as. 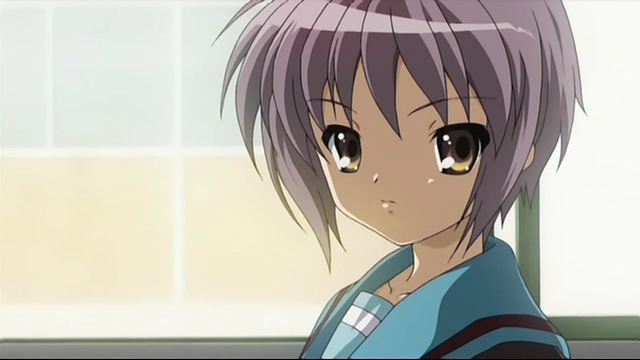 What we end up with is an Itsuki who enjoys the company of his friends, a Yuki who cares about Kyon’s welfare, a Haruhi who is happy until the next time she’s not, and a Mikuru who can never express her emotions for Kyon lest she bring Haruhi’s judgement down upon the world. 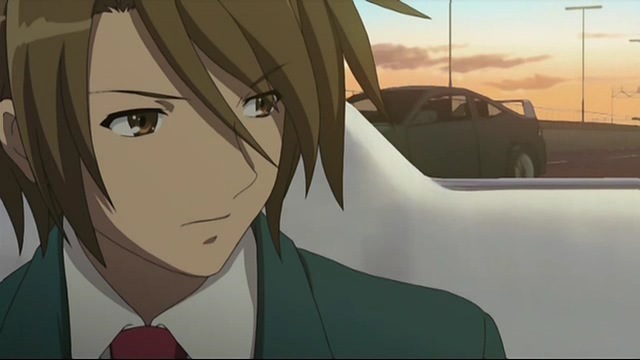 Some of that remains, but Kyon is … well, Kyon’s an unmanageable fiend, who I can’t really stand. He, too, is an anime fan. Leaving the rest of the series behind – the occasionally entertaining but ultimately pointless rest of the series – these two episodes are somewhere near greatness. 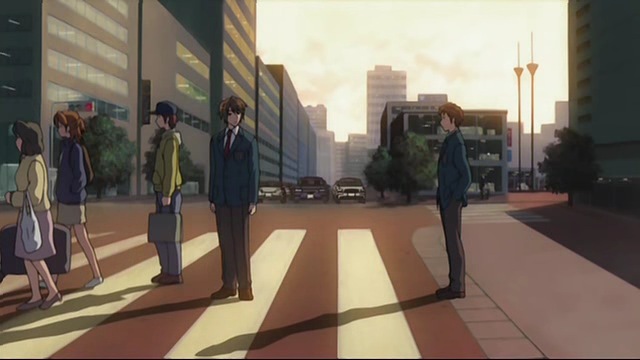 The penultimate episode had some really good “penultimate” feelings to it, but was bogged down in its exposition that was forced upon us in the form of a long car trip and the fact that Kyon refused to believe that Haruhi was special despite the fact that Asakura had taken him to a different world and beaten him up in the previous episode (chronologically speaking). Exposition in a penultimate episode is, of course, a way to have the final episode jam packed with all sorts of cool things without having to worry about explaining any of them. The audience already knows them and is happy to let celestial giants wash over them. I said earlier that an ending works well with build up. 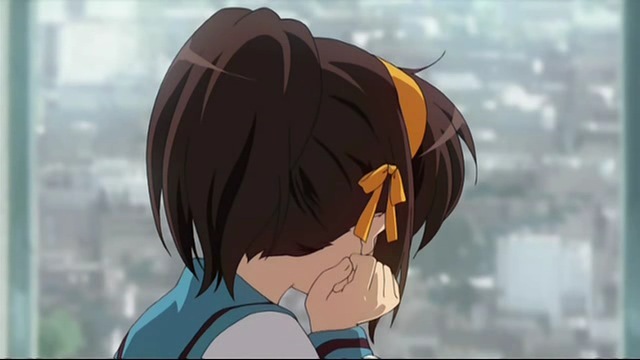 The way that Suzumiya Haruhi was structured allowed for no real build up, but these final episodes made it feel like it was built up. That’s almost as good. 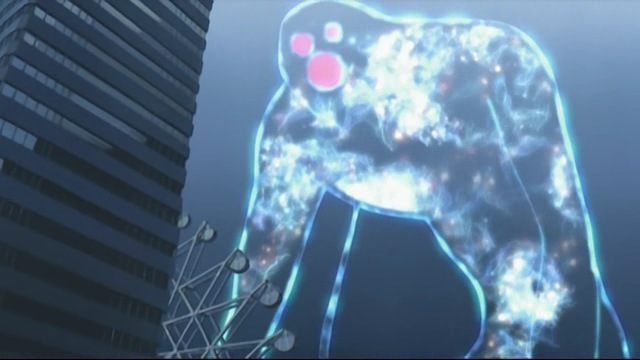 I liked everything about this final episode and I particularly liked the fact that Haruhi compared the case of the celestial giants to Nausicaa even without the name. 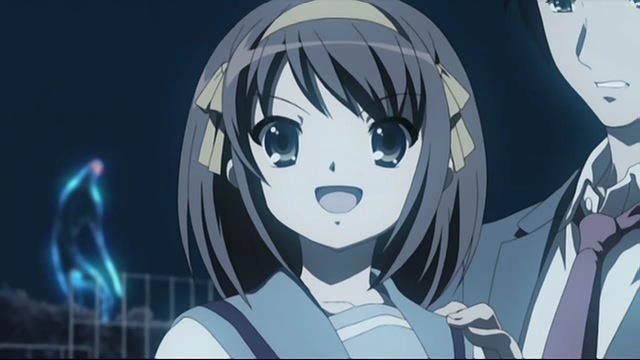 The Melancholy of Suzumiya Haruhi exploded into a hugeness that it didn’t deserve, but it was not a show without its merits. In my book its conclusion ranks among the best and, while I wish some of it could have been done differently, I’m ultimately satisfied: leaving with a smile on your face can frequently overwrite the many grimaces that you made along the way. If the characters really changed all that easily, then it would be a bit cheap, I think. 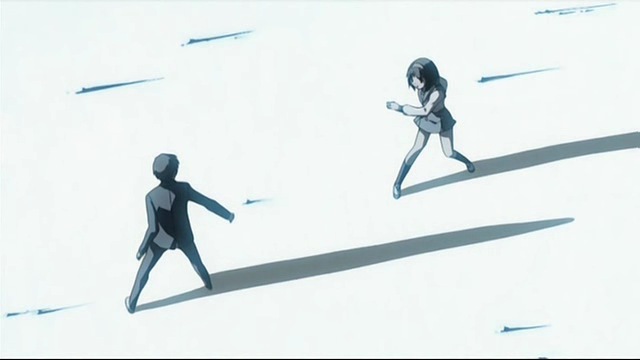 Real people tend to change slowly, even in the light of dramatic events. Character morphs after extended reflection, supported by multiple experiences. The noticible differences tend to occur during the boring periods–for those reasons, in fact. Something big happens, but life goes on as usual afterward. It’s accurate, but not as entertaining to watch. The changes are there, but subtle. I agree with Mac. 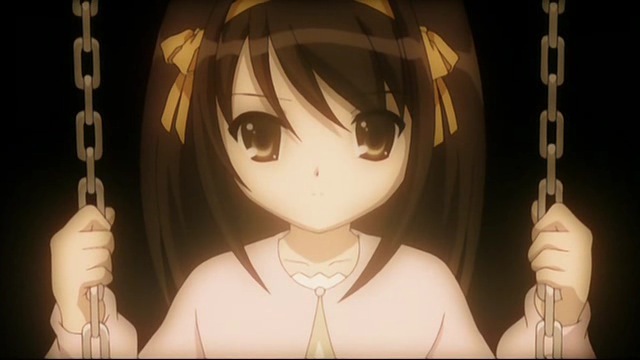 Can anyone reconcile the reflective Haruhi of ep.12 (“Live a Live”) with the manical Haruhi of ep. 2? 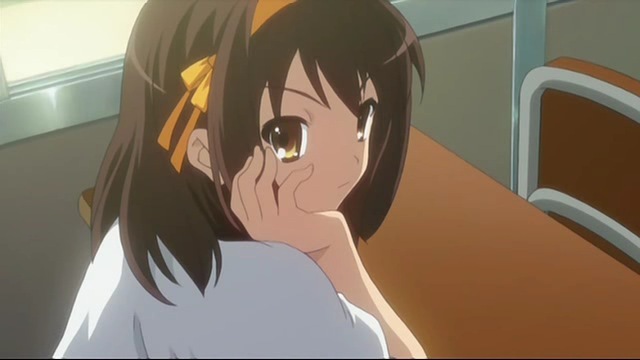 (“Melancholy of Haruhi Suzumiya I”) Or the cynical, jaded, ordinary Kyon of that episode with Ep. 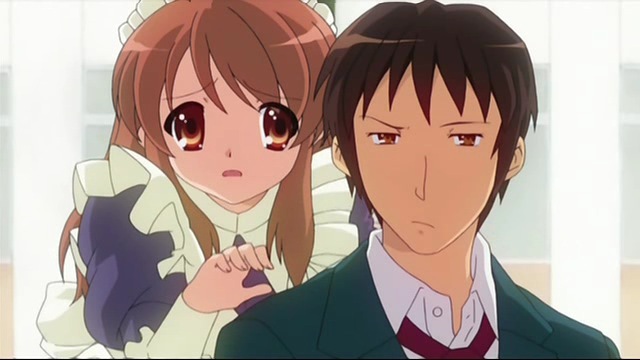 10 (“Day of Sagittarius”), who can calmly instruct his friends not to use their powers, even if it risks the world–because Haruhi needs to learn to accept disappointment? 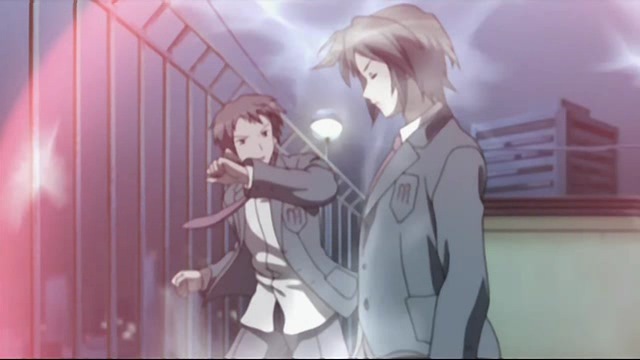 And who’s sensitive enough to realize that Yuki wants to win the game? 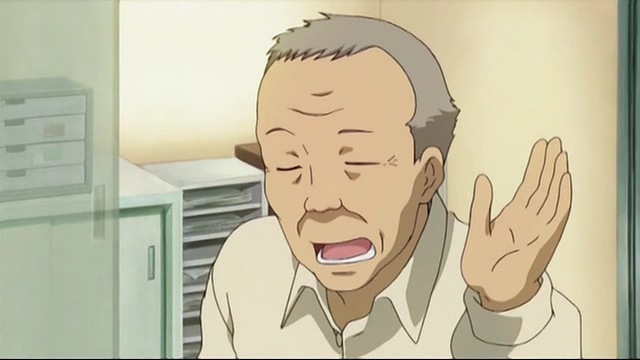 And then Itsuki rubs his nose in what that means vis-a-vis him and Haruhi. This wasn’t character growth like a transformation. It was a more gradual thing. 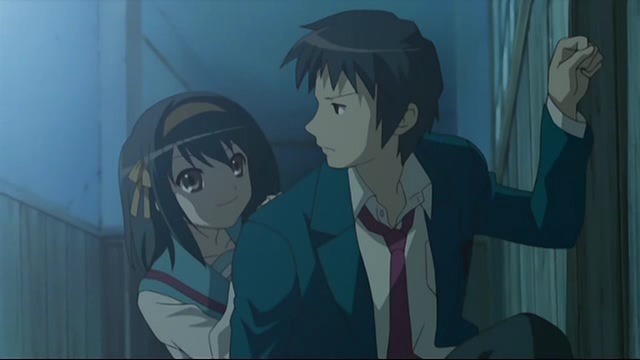 I think a lot of Kyon’s griping is because he can’t reconcile his base instincts (Mikuru is HAWT!) 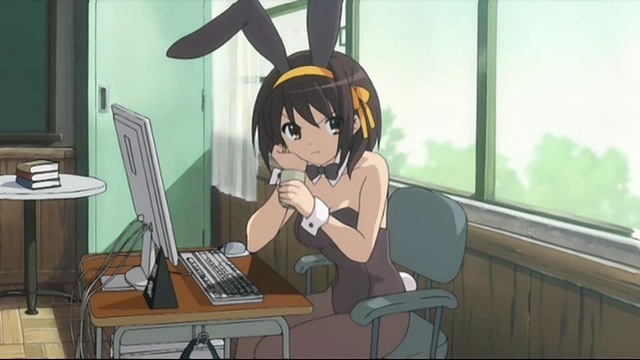 with his inner desires (Life w/Haruhi is damned interesting!) Heh. Do one of those dumb body-swap episodes, and watch him melt down if those two flipped. 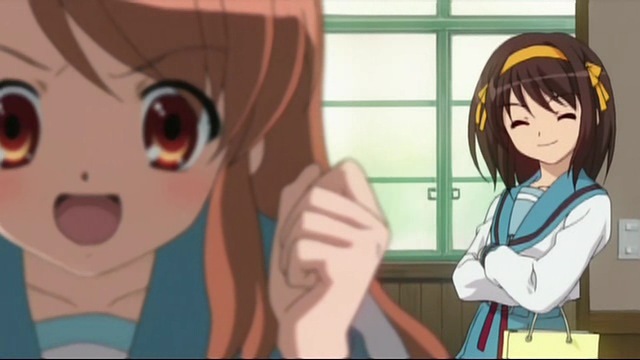 Or maybe worse, Yuki and Mikuru! Actually, I agree with that. 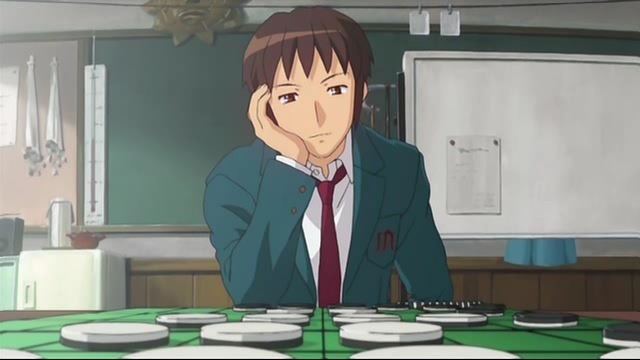 I suppose that it’s a combination of the chronology (having only seen each episode once, as opposed to some people having seen them fifty times each, I don’t remember all of the evidence of change), and the fact that I am really opposed to all of Kyon’s cynicism. You have to admit that it really can wear you down after a while.